May’s second batch of new titles begins with Linda Grant’s A Stranger City which seems to use the discovery of a body in the Thames to explore the nature of community in London, or the lack of it, through a policeman, a nurse and a documentary-maker. ‘The wonderful Linda Grant weaves a tale around ideas of home; how London can be a place of exile or expulsion, how home can be a physical place or an idea. How all our lives intersect and how coincidence or the randomness of birth place can decide how we live and with whom’ according to the publishers which sounds promising. I’ve not always got on with Grant’s fiction but enjoyed her last two novels: Upstairs at the Party and The Dark Circle. I’m not entirely sure about Mary Loudon’s My House is Falling Down which sees a marriage under strain when Lucy falls in love with Angus. Lucy is determined not to deceive her husband but is shocked by his reaction to her affair. ‘Infused with her trademark precision, clarity and dark humour, Mary Loudon’s searing, highly-charged novel My House is Falling Down is a fearless exploration of what infidelity means when no one is lying, and how brutal honesty may yet prove the biggest taboo in our relationships’ say the publishers which suggests an original take on the somewhat hackneyed theme of middle-aged infidelity. Nell Freudenberger’s Lost and Wanted could also go either way which seems to be becoming a theme for this post. A physics professor is determined to get to the bottom of why she’s received a phone call from a friend when she knows he died two days ago. ‘Helen is drawn into the orbit of Charlie’s world, slotting in the missing pieces of her friend’s past. And, as she delves into the web of their shared history, Helen finds herself entangled in the forgotten threads of her own life’ according to the blurb which leaves me a little mystified but I enjoyed Freudenberger’s The Newlyweds enough to give it a try. At first glance, Joanne Ramos’ The Farm is some way outside my usual literary territory but it comes garlanded with praise from all and sundry including Sophie Mackintosh and Gary Shteyngart. A young Filipina immigrant hopes to improve her life and her child’s, taking a job at Golden Oaks a luxury fertility clinic run by an ambitious business woman who’s spotted a gap in the market. Described by the publishers as ‘a brilliant, darkly funny novel that explores the role of luck and merit, class, ambition and sacrifice, The Farm is an unforgettable story about how we live and who truly holds power’ which reminds me a little of David Bergen’s Stranger. It’s the dark humour and class theme that attracts me to this one. I suspect there’ll be some dark humour in Paulo Maurensig’s A Devil Comes to Town set in a Swiss village where everyone’s a writer so absorbed in their work they’ve failed to notice the inauspicious signs, all but the new parish priest that is. When the devil turns up in a flash car claiming to be a publisher, the village’s harmony is shattered as literary rivalries are let loose. ‘Maurensig gives us a refined and engaging literary parable on narcissism, vainglory, and our inextinguishable thirst for stories’ say the publishers of a novel which could well be a great deal of fun. I’m rounding off this second instalment of new titles with Being Various: New Irish Short Stories put together by guest editor Lucy Caldwell. It’s the sixth volume in a series from Faber, apparently – I’ve clearly got a lot of catching up to do. Following In the footsteps of Kevin Barry, Deirdre Madden and Joseph O’Connor, Caldwell has assembled a stellar list of contributors which includes Eimear McBride, Lisa McInerney, Stuart Neville, Sally Rooney, Kit de Waal and Belinda McKeon. I’m sure there will be more than a few gems with writers of their calibre involved, and that’s a fabulous jacket. This entry was posted in Random thoughts, Reviews and tagged A Devil Comes to Town, A Stranger City, Anne Milano Appel, Being Various, Books published in Many 2019, Joanne Ramos, Linda Grant, Lost and Wanted, Lucy Caldwell, Mary Loudon, My House is Falling Down, Nell Freudenberger, Paolo Maurensig, The Farm on 15 April 2019 by Susan Osborne. In previous years I’ve merged December’s paperback and hardback offerings but the three paperbacks I have my eye on this year merit a post of their own, kicking off with Jessie Burton’s The Muse, cunningly published at the end of the month to capture the Christmas book token trade. Set in seventeenth century Amsterdam, The Miniaturist was hugely successful a few years back. Burton’s second novel begins in 1967 with Odelle Bastien, who left her Trinidadian home five years before, about to find her niche working in a London art gallery. One day a lost masterpiece with a story behind it is delivered, purported to be by the legendary Isaac Robles. Burton’s novel untangles the painting’s history taking her readers to Spain in 1936. Lots of very complimentary reviews when it was published in hardback. I’m not sure Rachel Cantor’s Good on Paper got much coverage at all when it was first published here in the UK. A frustrated young woman with a few published short stories under her belt, is stuck in the temping world. Her life seems about to be transformed when a Nobel Prize winning author offers her the opportunity to translate his book. Unfortunately, as instalments of the manuscript roll in, it becomes clear that the book is untranslatable. ‘A deft, funny, and big-hearted novel about second chances, Good on Paper is a grand novel of family, friendship, and possibility.’ say the publishers which sounds like rather a nice way to round off the reading year. My last choice, Andrea Canobbio’s Three Light-Years, is the only one I’ve reviewed. Still living in the same apartment building as his mother, his ex-wife and her new family, forty-three-year-old Viberti longs for a child. He meets Cecilia whose son is suffering from an eating disorder and manages to get the boy to eat by distracting him with a conversation about James Bond. Before long Viberti and Cecilia are having lunch together. Subtle, often funny, sometimes infuriating this is not a novel for those wanting a conventional love story – there are times when you want to give Viberti and Cecilia a good shaking – but I enjoyed it very much. Nicely ambivalent ending, too, much like life. This entry was posted in Random thoughts, Reviews and tagged Andrea Canobbio, Anne Milano Appel, Good on Paper, Jessie Burton, Rachel Cantor, The Miniaturist, The Muse, Three Light Years on 28 November 2016 by Susan Osborne. Jacqui from JacquiWine’s Journal commented on my books to look out for in December post that Three Light-Years’ jacket seemed to fit its synopsis well: a grey, rainy day in which a woman is looking over her shoulder at a man, her expression a little solemn but unreadable. We can’t see his but it should be somewhat more puzzled than hers to really fit the book’s contents. Three Light-Years is a love story although not a conventional one: a novel about relationships in all their many permutations. Claudio Viberti is a doctor, an internist specialising in geriatrics. His best friend works in paediatrics and it is here that he meets Cecilia, a doctor from A & E whose son is suffering from an eating disorder. Forty-three and still living in the same apartment building as his mother, his ex-wife and her new family, Viberti – as he is known – longs for a child. Distracting Mattia with a conversation about James Bond, he manages to get the boy to eat and so begins an odd relationship. Viberti will rarely see Mattia over the novel’s three-year span but he will have lunch with Cecilia almost every day: boiled vegetables for him, a sandwich for her. Their relationship progresses in fits and starts. Viberti soon knows that he’s in love with Cecilia but her feelings are more ambivalent. Her divorce is more recent than his and she’s consumed with worry about its effects on Mattia. Meanwhile, Viberti realises that his eighty-three-year-old mother may be demented but he and his ex-wife, still devoted to Marta, have very different ways of dealing with it. Into this convoluted relationship walks a third party, completely by accident: Cecilia’s sister, Silvia. We know very early on that this subtle, often funny, sometimes infuriating love story is being told by Viberti’s son. He’s an unobtrusive narrator, popping up infrequently as if to remind us of his existence as Canobbio’s narrative shifts between Viberti, Cecilia, then Silvia, backwards and forwards over the three years. Canobbio – and his translator, Anne Milano Appel – has a sharp eye for striking phrases: ‘A man hidden behind a column, observing the world’ perfectly describes Viberti’s reserve as he looks out into the café hoping for a glimpse of Cecilia as does ‘guilt was the alimony Viberti paid to Giulia’. Family relationships with their usual complexities are made vivid through memories, a strong theme in the novel. There are times when you want to give Viberti and Cecilia a good shaking but the gentle humour with which Canobbio recounts their seemingly endless misunderstandings, angst ridden speculations and occasional connections, lightens the mood. Viberti is particularly well drawn – excruciatingly socially awkward, always wanting to do the right thing and often unsure of himself. Not one for those who want a conventional love story but I enjoyed it. Nicely ambivalent ending, too, much like life. This is my last review for 2015. The rest of December will be taken up with books of the year – far too many as ever – looking forward to January and, of course, Christmas. Can’t be avoided, I’m afraid…. This entry was posted in Reviews and tagged Andrea Canobbio, Anne Milano Appel, Italian fiction, Maclehose Press, Three Light Years on 4 December 2015 by Susan Osborne. Slim publishing pickings in December – a bit of famine after the autumn feast. 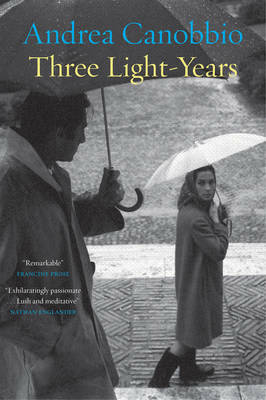 Not a great month if you’re looking for anything cheerful, either, but an excellent one for fans of fiction in translation beginning with Andrea Canobbio’s Three Light-Years. Cecilia and Claudio share lunch most days in the hospital where they work. Both are embroiled in difficult domestic situations: she’s a single parent, newly separated – he lives in the same apartment building as his senile mother, ex-wife and her new family. Despite their powerful attraction both are wary of their friendship becoming something more until a chance meeting changes everything. Canobbio’s novel comes from Maclehose Press who have quite an eye for fiction in translation. As do World Editions, a new publisher on the UK block who have published several interesting titles this year including Esther Gerritsen’s Craving. December sees the publication of You Have Me to Love the first adult title from Dutch children’s writer Jaap Robben. Mikael lives on an island between Scotland and Norway. When his father disappears into the sea one day Mikael refuses to talk about it and his mother becomes mad with grief. Not exactly cheery, I know, but given World Editions’ track record it seems worth a look. The next title is by Japanese Nobel laureate Kenzaburo Ōe, reported to have been working on a novel featuring a character based on his father by the New York Times a little while ago, apparently. Death by Water sees an ageing Nobel Prize-winning writer – struck by writer’s block and struggling to find the words to write about his drowned father – returning to his village in search of a cache of documents which may offer the solution to his predicament. Serpent’s Tail is reissuing another Nobel Prize-winning author’s novel, Herta Müller’s The Passport, this month. I’ve read just one novel by Müller which I enjoyed immensely but have somehow not got around to reading more. This one interweaves stories from the present and past, centring on a village in Ceaucescu’s Romania whose miller wants to migrate to West Germany. Beautiful writing, apparently, which I remember from The Land of Green Plums. That’s it for December. I’m hoping for some cheerier novels in January. In the meantime a click on a title will take you to a more detailed synopsis should you be interested. And if you’d like to catch up with November’s embarrassment of riches they’re here, here and here. This entry was posted in Random thoughts and tagged Andrea Canobbio, Anne Milano Appel, Craving, Death by Water, Esther Gerritsen, Håkan Nesser, Herta Müller, Jaap Robben, Kenzaburo Ōe, Martin Chalmers, The Land of Green Plums, The Passport, The Summer of Kim Novak, Three Light Years, You Have Me to Love on 23 November 2015 by Susan Osborne.